This week I visited the offices of McGraw-Hill Professional in Manhattan. As it turns out, Gaya told me, my book has been a hot commodity so the fact that it wasn’t in the lobby meant it had been swiped by an employee or guest. That was a good sign, I was reassured. So far, I’ve been very impressed by the creativity and dedication of the MHP team. What do you think of the promotion we’ve done for the book? What else would you do if you were in our shoes? Help me demonstrate the lesson of chapter 2 and tap the wisdom of the crowds here! Is Google Taking Too Much Credit? 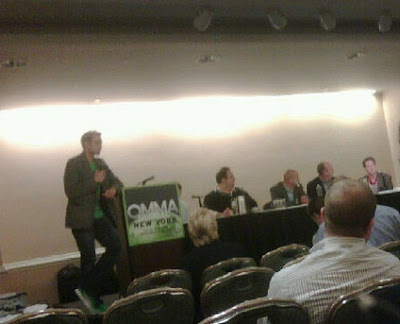 That’s the question I’ll be addressing on my panel at OMMA Global in New York today. Here’s the prep sheet I sent to my panelists. Will update this post tomorrow with session highlights. 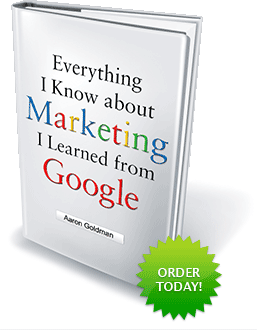 Google recently announced that its search and advertising tools generated $54 billion of economic activity in the U.S. in 2009. But, as we all know, there are a number of different factors that contribute to sales conversions both on and offline. In this session, we’ll examine the role of search in the media mix and discuss best practices for evaluating performance across all channels. We’ll also look at some of the more evolved attribution models being deployed by search marketing advertisers, agencies and technologies. Please be prepared to weigh in with your thoughts on the methodology and findings. Since SEM is so dependent on consumer demand/interest, it can be difficult to budget for it. What are some best practices? Should search be the first line item budgeted for or the last? Somewhere in between? What about SEO? How does one approach this unpaid media opportunity? How can one measure impact of other online ads on search? How can one measure impact of offline ads on search? What tools are available to help with attribution? What will the digital marketing landscape look like in 5 years? What will Google’s role be? How will budgeting and attribution strategies evolve? How can marketers best prepare today? Lots of great conversation and insights. Greg – studies show the overall value of the Internet between $300 billion and $1 trillion so $54b is a drop in the bucket. (Sounds awfully like the Google monopoly defense.) Attribution is not a zero sum game. The pot for all of digital is getting bigger. Eli – when thinking about attribution, don’t forget about offline. Oh yeah, and comScore has tools to help you do that. Justin – with Facebook ads now being integrated into SEM platforms such as Efficient Frontier and Kenshoo (disclosure: my employer), it’s critical to measure the interplay between channels. Adam – you have to get the right people in the room from the client, agency, and technology partner side to have a real discussion about attribution. That includes marketing, IT, etc. Peter – it’s critical to track lifetime value and segment customers by value when evaluating credit for each channel. Not all customers are created equal. Here’s one of the brief moments I was actually up at the podium. You can’t tell but I’m wearing a green Google Me tee and matching Pumas. Update 2: Here’s a better pic courtesy of my colleague, Paula, at Kenshoo. Good view of the green ensemble. Update 3: I just got another one of those phishing emails and was reminded of a great exchange during this session with Greg from Google. As a follow up to his analysis of the economic impact study, I asked Greg if Google counted the millions in impact from the Prince of Nigeria floating funds through my account in the US. Greg: How’d that investment work out for you? Me: Can Google help me get my money back? Greg: Sure. Send me your social security number. Me: Don’t you already have it??? Over 550 people RSVP’d so Andrew Landan, who runs CISC and is pictured above with the red headphones, told everyone to arrive early. They did. The line started queueing 30 minutes before the doors opened. Inside, to paraphrase my MLK-day entry for the 3six5project, “the scene was serene if you know what I mean.” The crew from Borders was all set up and ready for the big book blowout. 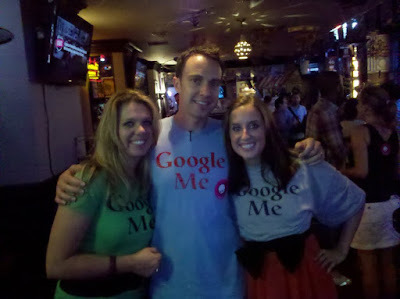 The Google Me tees were in full effect courtesy of KosherHam.com. Kiley and Steph were kind enough to model them. Scott and Karen weren’t sporting the tees but they sure brought their A grins. V-Red and Paul were most definitely in the house. Everyone was getting Googley tonight. Thanks to all who came out… especially those up past their bedtime!